Our Bristol salon stocks CND Vinylux, the one week Nail polish designed to compliment your Shellac Manicure but allowing you to self apply, or have applied in Salon with your manicure or pedicure if you do not want the benefit of shellac – which last on average 2-3 weeks. If you wish you can have a shellac manicure but now be able to have the same colour on your toes with Vinylux – it won’t last as long as shellac but you can top up yourself, but you must use the top coat which can be purchased at pamper me with a large selection of colours. 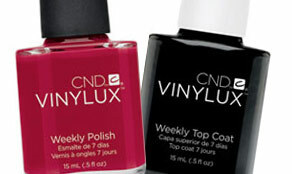 VINYLUX Weekly Polish and Weekly Top Coat are a unique system designed to work together. Exposure to natural light secures the ProLight technology, creating an enduring, long-lasting polish. While ordinary polishes become brittle and deteriorate over time, VINYLUX dries naturally to a flawless finish and strengthens its resistance to chips over time. Watch The Video – Warning Contains Flash photography and Bright lights!